"Zinc oxide growth and its interfaces with metals observed by photoemission"
Thin films are a common way to add functionality to flat glass. 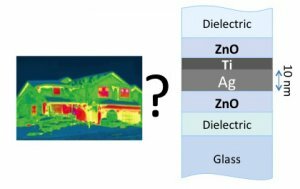 In a wide range of commercial products for housing and automotive industry, thermal insulation is improved by the deposition of a continuous nanometric-thick film of silver which is thin enough to ensure optical transparency but thick enough to reflect infra-red light. The active film in these low-emissive coatings is encapsulated into complex stacks of dielectric materials deposited at the industrial scale by magnetron sputtering on windows panes. Deleterious dewetting or delamination may impact the performance and lifetime of the product due to a poor adhesion of silver with other layers. Silver is therefore sandwiched in between ZnO(0001)-textured films which turned out to be the best candidates to improve silver crystallization and adhesion. Blocker layers of transition metals, such as titanium, are also added at the interface. In this industrial context, the present thesis focused on several fundamental aspects of metal/ZnO interfaces by combining surface science approaches on single crystals and model sputtered films. Several original measurements strategies and model systems have been employed to tackle the questions of the Ag/ZnO electrical contact, of the control of the polarity of sputtered ZnO films on an amorphous substrates and of in situ follow-up of chemistry of buried Ti/ZnO interface during thermal treatment. Silver films from submonolayer to percolated thick films were grown by thermal evaporation on (1 × 1) O- and Zn-terminated ZnO(0001) surfaces prepared by sputtering-annealing cycles in vacuum. Diffraction, microscopy and plasmonics showed that Ag grows epitaxialy with (111) hexagon-on-hexagon orientation in the form of flat top clusters. The epitaxy is explained by a preferential nucleation and growth at polar step edges. The interplay between morphology, polarity and hydrogen adsorption on the band alignment between silver and ZnO(0001) faces was explored by combining ultra-violet and hard X-ray photoemission. Pristine surfaces present a strong upwards band bending and the surface preparation leads to degenerated semi-conductor with a Fermi level above the conduction band. While exposure to atomic hydrogen bends the band downwards, H chemically reacts differently with the two ZnO surfaces. It breaks Zn-O back bonds, releases metallic zinc and creates on OH groups on ZnO-Zn while only the O 1s core level fingerprint of hydroxyls is observed on ZnO-O. At the early stages of Ag growth that parallels the observed formation of 2D particles, charge transfer occurs at the interface : cationic Ag on the ZnO-O and anionic Ag on the ZnO-Zn surface. Then, the adsorption of silver becomes rapidly neutral. For thick films, the electrical contact at the interface is of Schottky type with a barrier height around 0.5-0.7 eV, independently of the surface termination or hydrogenation state. The contact seems to be dominated by interface states induced by the metal adsorption. The control of surface termination and crystallinity of ZnO thin films deposited by magnetron sputtering on Si wafer was systematically explored as function of substrate temperature and bias voltage. It was discovered that the growth rate can be highly influenced by a combined effect of resputtering and of temperature. On a hot susbtrate, SiOx formation and /or intermixing are favoured, significantly slowing down ZnO growth. All ZnO samples were polycrystalline (0002)-textured and slightly over-stoichiometric in oxygen. Using an orientation-dependent fingerprint in the X-ray valence band spectrum of ZnO, an experimental temperature/bias diagram was derived showing the conditions in which the film polarity can be controlled. The interfacial reaction between those ZnO films and Ti was investigated in model Si/ZnO/Ti/Mo(cap) stack upon thermal treatment. Using a combination of high energy photoemission at synchrotron and desorption spectroscopy, it was found that the redox reaction between ZnO and Ti gives rise to the formation of a set of Ti oxides (Ti(II), Ti(III), Ti(IV)) and metallic Zn that is highly mobile and escapes the sample. After annealing at 550 °C, Ti4+ becomes the dominant oxidation state and a mixed ZnTiOx compound is formed at the Ti-ZnO interface. The influence of the initial ZnO quantity and crystallinity on the reaction was also studied. Those findings were correlated with thermodynamic simulations of the simulated phase diagram of the Ti-ZnO system.